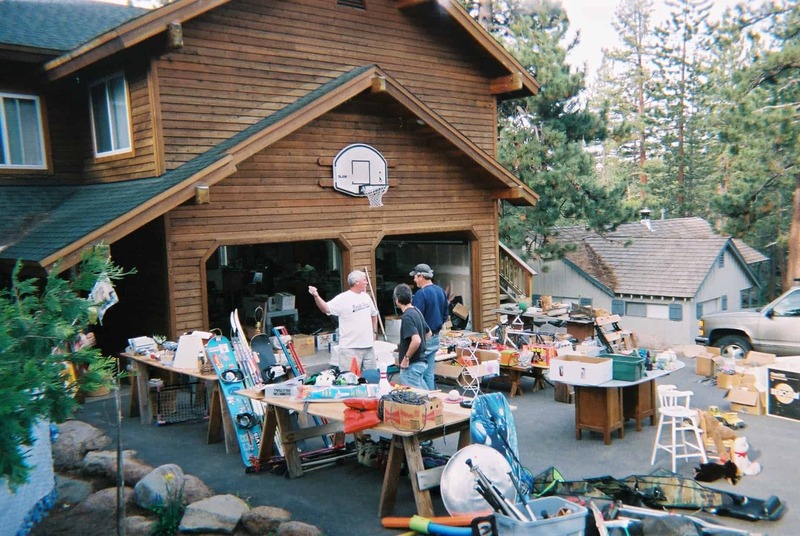 These garage sale tips and tricks will help you get maximum profits, even if you don’t have any big-ticket items to sell. My husband and I recently held a garage sale, and it was a big success. Because we were moving to North Carolina and downsizing from over 2000 sq ft to just over 1000 sq ft, we wanted to get rid of all the items that were just taking up space. We didn’t have any big-ticket items to sell – no furniture, large appliances, etc, but we still made almost $400. Not bad for a few hours work! As a child, I remember my family regularly getting together and holding a big garage sale. My sisters and I would go through our toys and painstakingly decide which ones we were willing to let go. I would always feel guilty and apologize to the toys I was selling – I was so sentimental, and I still am. I may or may not have apologized to a throw pillow that I bought right after my husband and I got married, as I tossed it on the pile. 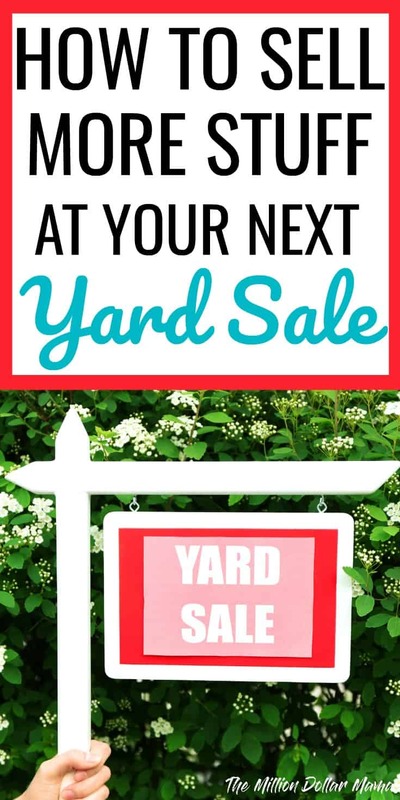 If you’re thinking of having a yard sale soon, these garage sale tips and tricks will help you make the most money possible! Use fluorescent card stock, and make BIG, easy to read signs to grab people’s attention. Use tables to set your items on. People are more likely to browse your items if they’re displayed on tables, as opposed to on the ground. Be willing to accept offers. People will haggle, and they expect to get a good deal at a yard sale. It’s better to accept slightly less money than to not sell the item at all. Make your prices LOW. This is a yard sale, not a high-end boutique. People come for bargains. On this note, there are a couple of things that I don’t sell at garage sales – books and brand-name clothes. You can make a lot more money by selling books on Amazon. As for brand-name clothes, I like to sell mine on ThredUp. Offer suggestions. If you see someone who wears the same sized clothes as you, let them know that you have a whole bunch of clothes in their size. If someone purchases a home decor item, tell them about other home-related items you have. I’ve been to so many yard sales where I’ve walked up and almost been made to feel like I was an intruder. I’m talking people ignoring me when I say hi, and then staring me down the entire time I’m browsing. Don’t be that person. Make people feel welcome! The great thing about yard sales is that often people will buy things they didn’t even know they wanted/needed, just because it catches their eye when they’re browsing. This is why it’s a good idea to have a wide variety of items to sell – it gives people more to look at and entices them to stay longer and buy more! If you don’t have much, consider joining forces with a friend or family member. Try to think of your yard sale as a small business you’ve started. If it were a business, you’d be advertising everywhere, wouldn’t you? So make sure you post the details of your yard sale on Craigslist, Bookoo, and any local Facebook yard sale groups, bulletin boards at local grocery stores, gas stations, church, etc. I’ve also found that people love to see pictures of everything set up, so they can see that it’s worth their time driving out to your house. At my recent yard sale, a gentleman inquired about a cheap coffee machine I was selling. I told him the price, and he seemed interested but didn’t pick up the item to purchase. Towards the end of your yard sale, discount prices even further. I was selling all my clothes for $1 a piece. Once we got to the last hour, I discounted everything to 2 pieces for $1. Note that I didn’t drop the price to 50 cents a piece – the goal was to both move items and make money. Selling two items for $1 is better than selling 1 item for 50 cents. These are all the tips I implemented in my most recent garage sale, and it was the most successful garage sale I’ve had, to date. It can be a bit of work setting everything up, but your hard work will pay off in the end, with less household clutter and a nice chunk of cash.